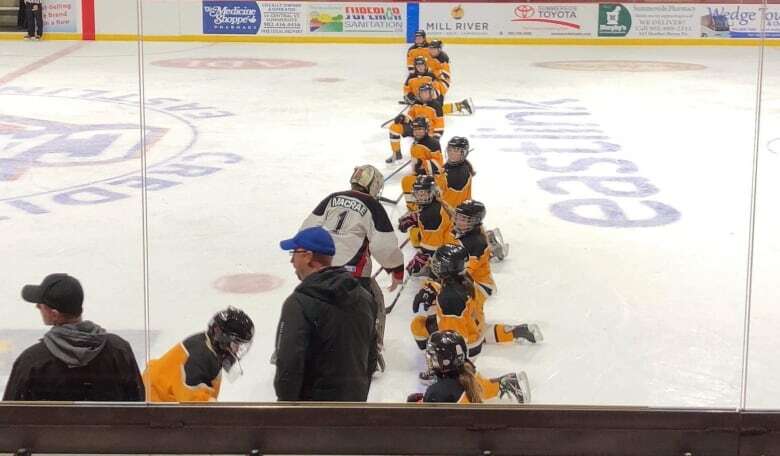 A peewee-A girls hockey team from Tignish, P.E.I., has shown parents, coaches and opposing players what true sportsmanship really looks like. Sometimes the most memorable moments in sport happen after the game is over. That was certainly the case last weekend, when a peewee-A girls hockey team from Tignish, P.E.I., showed parents, coaches and opposing players what true sportsmanship really looks like. Tignish Aces manager Sonya Bernard said it was something the team will never forget. "It was just a moment of, 'This is what it's all about.' And to teach it to such young girls is just amazing because they are never going to forget that moment either." The story started a few weeks ago, when the Capital District Cyclones travelled up west to play against the Aces. The Cyclones had to play the game that night without their goalie, 12-year-old Kara MacRae, because she was at an appointment at the IWK Hospital in Halifax. Kara has been battling cancer for the last year and travels to the IWK every few months for checkups. Just two months after Kara's diagnosis, her mother Violet Robinson learned that she also had cancer. 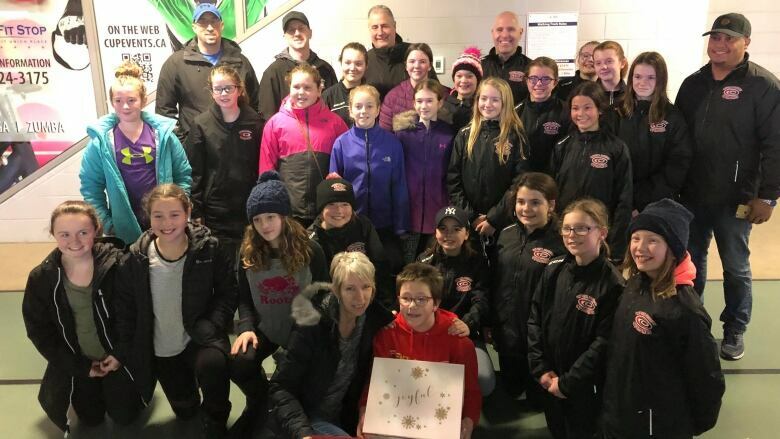 When the Tignish hockey team heard that both mother and daughter were fighting cancer, they decided to do something to help. Parents, players and coaches started putting together a special box filled with personal gifts and encouraging messages. They named it the Sunshine Box because they wanted it to brighten Kara and Violet's lives. "We just wanted Kara and her mom Violet to know that we were thinking of them and I guess in return for us, we were teaching and showing our own girls how to be kind," Bernard said. The Aces spent three weeks collecting gifts for Kara. 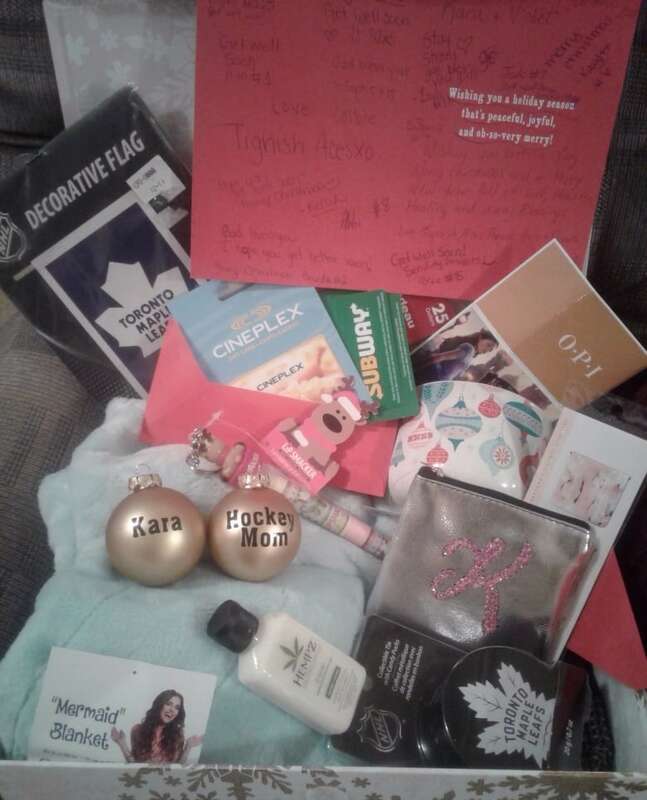 The Sunshine Box soon began to fill up with a mermaid blanket, a flag from Kara's favourite team the Toronto Maple Leafs, nail polish, a journal, candy and some gift cards for movies, food and gas. The team even included two personalized handmade Christmas ornaments for mother and daughter. "Everybody started putting some things in and we tried to make it a little personalized for her, as well," Bernard said. "We all did a card and all the girls signed it for her." The Tignish team planned to give Kara her surprise the next time the teams played one another. It came last weekend when the Aces and the Cyclones faced off at a tournament in Summerside. This time, Kara was dressed in her goalie gear and ready to play. 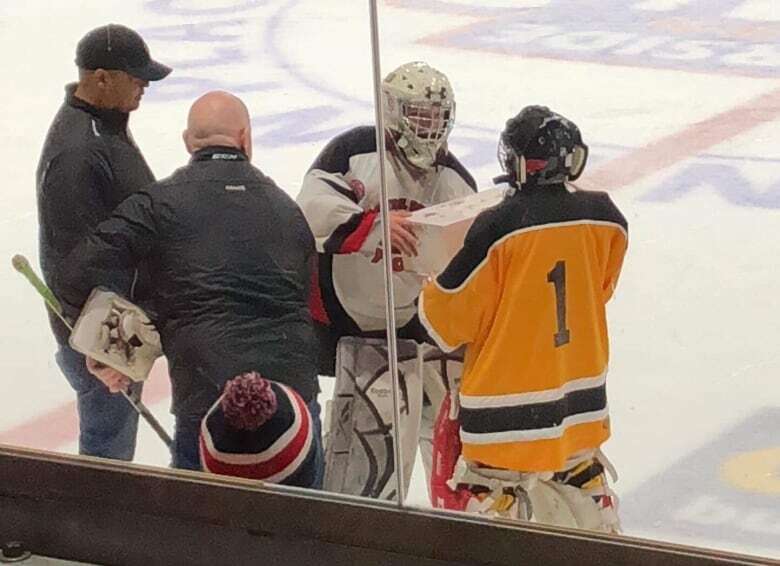 After the game, as the teams shook hands, Tignish coach Scott Perry pulled Cyclones coach Greg Rivard aside and asked if it was OK if his team presented Kara with a gift. When Tignish goalie Ava Ellsworth presented Kara with the Sunshine Box, Kara peeked inside, and handed the box to Rivard. "Then she went right down the line of our Tignish girls and shook hands with each and every one of them while the rest of us were in tears and clapping," Bernard said. Rivard said after a lifetime of playing and coaching hockey, he had never seen a moment more moving. "I don't think there was a dry eye in the rink," Rivard said. "It was just one of those moments that really you couldn't even put into words. It was sportsmanship, it was love, it was friendship. Two teams battling on the ice, ended up being one team at the end of the game, which was so nice." Kara said she was surprised and touched by her opponents' special gift. "Everyone was yelling and saying 'Kara, Kara.' And I was like, what, what, and there was this big box and I was like, 'Is that for me?' I wasn't expecting it, it was a really big surprise. I was really happy and it was overwhelming." 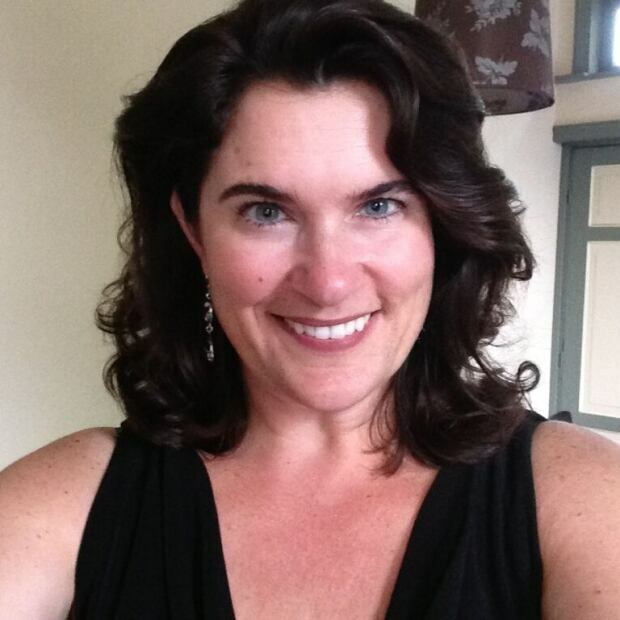 Kara has finished chemo treatments and had her last cancer scan in October, which doctors said looked good. Kara is scheduled to go back to the IWK in January to have another scan. Her mother is hopeful that it will be clear, as well. Robinson said the generosity and thoughtfulness shown to her daughter is an inspiration. "All I could do was cry because it's been quite a challenging year for Kara and I," Robinson said. 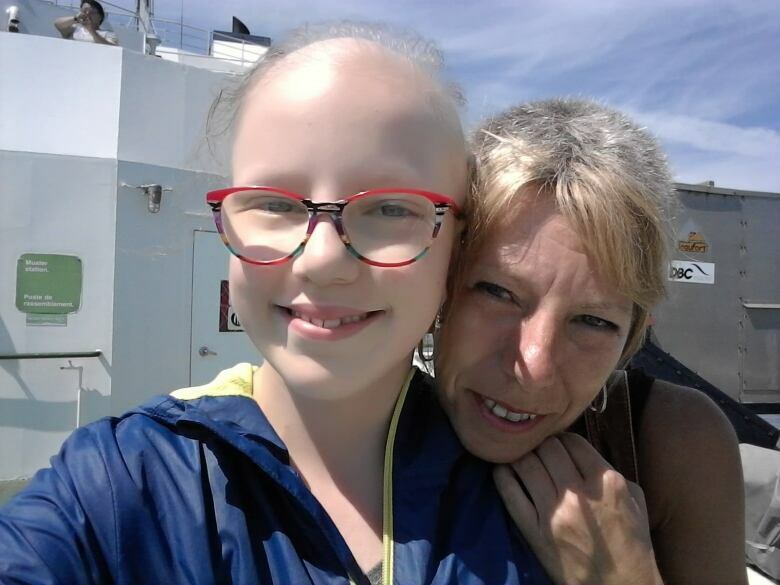 "Even though her treatments are done, we still have to go to Halifax every three months for scans and we are really hoping that her cancer doesn't show up again. The kindness from people has been amazing and to see these young girls with so much love, kindness, thoughtfulness, sportsmanship, it just moves me beyond." The Cyclones and Aces stood side by side for a group photo after the game. "I will always remember the amazing example that those girls showed to every other hockey player," Robinson said. "Just a true show of beauty. It shows that these kids, they get what life is really about, being kind to other people, you can never go wrong that way." Bernard said her team never wanted any recognition for their gift, they simply wanted to make a young girl and her mother feel happier. But in the end, the happiness they gave, grew. "When we left Summerside that evening after we did the group picture, we walked out of that rink, we played three games that weekend we had zero wins," she said. "We actually had zero goals and we thought we'd be walking out with our head hanging ... but when we walked out, we were just so happy. We couldn't have felt any happier if we would have won the whole tournament."